There’s no quicker way for life to get your immediate and undivided attention than when physical pain becomes your daily reality. This was my unexpected experience with endometriosis. It all started back in 2011. Yet I know now it started much earlier than that. When looking further into the topic of endometriosis, I discovered that it takes an average of 10 years for women to be diagnosed. 10 years during which endo sisters suffer, being told that the pain they’re experiencing (whether physical or emotional) is all in their head, that they’re experiencing “normal” PMS symptoms (to which I always say: “no!!! PMS is NOT normal!”), that it will get better and they just need to wait. Wait for what?! Before I got diagnosed with endometriosis, I remember having menstrual cramps. I knew from my mother that this was “normal” and I “just” needed to take painkillers when the pain was there, so that’s what I did. I didn’t know any better. Like so many women and teenagers out there. I continued living my life like many women do. No pain during most of my cycle, and then pain around menstruations. Mood swings. Tiredness. All part of being a woman we’re taught. Until the pain became unbearable. Until the pain was so intense that I couldn’t sleep. Until the pain was so excruciating that I was wondering if it would ever stop and how to get it to stop. Until the pain became so present in my life that it affected my thoughts. I asked around me to see what could be done. My doctor told me it was due to lack of iron, so I got an iron injection. It didn’t help. Then I was told I was depressed, so I started on anti-depressants. Strangely enough, these didn’t help either. And then I found after a comment from a friend, that I might have endometriosis. My gynaecologist at the time mentioned to me that the only way to be sure of whether I had endometriosis, was to have a surgery. So I had the surgery, and when this was done, he told me that yes, I had endometriosis, and well! one of my tubes was closed and he couldn’t re-open it, so I had lost it. At 32, this kind of puts a damper on what you imagine your future life can be. But at least with the surgery and the treatment, I wasn’t in pain… for a few months. Though looking back opened my eyes to the side effects we don’t speak about: weight gain, mood swings, lower bone density, immune system going down. We don’t speak about these, yet they exist. Side effects of medications we take to help ourselves. And then when I stopped these because it was considered unsafe to take these injections for more than 5 months, the pain resumed. What to do next? More treatments, more pain-killers. Yet they didn’t work. They made me feel like a stranger in my own body, putting on more weight, feeling sick and unwell, and the pain subsided. When I got diagnosed with endometriosis, I have to confess I was very happy! I thought that because we now had a label of what I had, my doctors would be able to cure me and I could go back to living my life the way I was doing before. As the story proceeded, you can see it wasn’t quite like that. And when the pain resumed, it also led me to the most difficult decision of my life, one that many endometriosis sufferers have to make as well: either I was finding a solution to get out of pain, or if there was no solution to be found, how could I keep on living… We rarely speak about how our hormones affect us. In fact when I speak about hormones to the women around me, they turn their head and tell me very often that they’re fine and that they’re not menopausal yet. But hormones are with us every single step of the way, from when we’re born until we die. They affect us physically and emotionally. And the more we understand this, the more we can create a brighter future for ourselves and for our children. Granted I don’t have daughters, I have sons. But as I raise my sons, I want them to understand their own hormones. Male hormones is not my specialty, but I hope to show them how by understanding their biology they can create a more empowering future for themselves. I also hope that by educating them on this topic, they can be more supportive to the women around them as they grow up. I know they have a wonderful role-model already, in my husband. He’s the person in my life who’s most supportive. He stayed close to me and helped me every single step of the way. He encouraged me to keep on searching to find solutions even when I thought that all hope was lost. And I did. I got out of pain. The rest is history. Or, rather, the rest has become a huge part of who I am and who I am helping these days. I know endometriosis sufferers can get better. I know we can reduce our pain and even get out of pain. I know we can get pregnant. I’m here to say to women who are going through similar health challenges as I was: you’re not alone. There’s a solution. It’s not easy, but when you find the right support group and the right people to mentor and guide you, you can get there too. And so, for me, as I found solutions to manage my pain and understand my symptoms, I also reached a point when what mattered to me was to share my story and solutions with other sufferers. What follows is my best advice on how to become your own health advocate, the CEO of your health. If at any point in time you’d like to discuss how I can help you, you can schedule a complimentary 30-minute optimised health discovery call with me. Until then, what follows are my best recommendations. I am a bit old school. Despite how modern our society is, and the huge amount of information that is available online, I found that my preference was to start with reading books. I thought if I wanted to find someone who had done some research and organised his or her thoughts clearly, a book would be the best option. So I started there. There are many books on the topics and you do have to do your research, test out the different tools you’re being presented with, but it’s a great start. A cheaper option when you can’t afford to hire someone who can guide you to find an individualised solution that fits both your budget, lifestyle and life goals. Considering how modern we are, internet should also be leveraged. There are plenty of great articles out there on endometriosis, which allow us to kick start a search. For me though, internet is mainly beneficial when we are trying to get more information on a particular topic, and asking a question that was asked in the past by someone else. Then we need to consolidate the information we found in something more structured and thought through. For that, I found Facebook to be a great help. Of course there are some groups which are more useful than others, but I was able to find a couple of groups I really loved where I found support and knowledge, people to share what I knew about, and who also were sharing with me what they learned. When looking for a group, my advice would be to find one that has the same ethos as you, AND is positive and supportive. 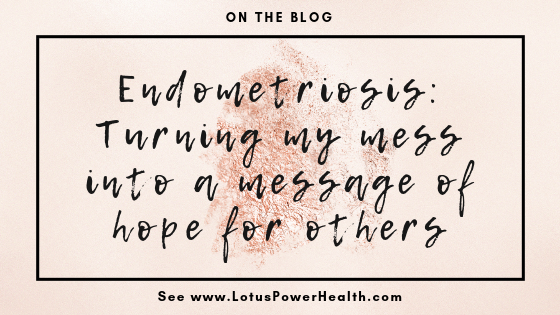 There are a few endometriosis groups out there when sufferers would just be happy to complain and are not looking for solutions; and these will not help you get better if what you’re looking for is a light at the end of the tunnel; and someone to emulate, who has gone through it all before you. If you’d like to join a supportive community, I invite you to join our Radical Wellness for Women community on Facebook. Not everyone is suffering from endometriosis, but everyone is supportive and loving and caring. Having a peer to discuss my health situation with was very helpful for me as it helped me find my path. Speaking with her allowed me to get my thoughts out and yet refocus myself based on the objectives I had. Getting out of pain from endometriosis demands a lot of strength, both physical and emotional, and having my accountability partner helped me stay focused. Since then, I have gone from having an accountability partner to coaching and consulting. I am now helping now women who are experiencing the pain and overwhelm of endometriosis to find their own plan of action to get better, and reclaim not only their health but also their lives. Your getting better involves a particular diet, lifestyle changes and mindset changes. If your family and friends are supportive of you, it will be easier for you to stay on track with your goals and ask for help when you need some. Explain to them what endometriosis is, how you’re feeling, what your symptoms are, and the changes you need to start making. Explain to them what will happen if they don’t support you in making these changes, and help you stay committed to improving your health. If they aren’t supportive enough, find someone who will be there for you every step of the way. It is paramount to you getting your health back. As you create your own plan of action, you will find that this hope you had lost will slowly come back. Taking charge of your health might just be the remedy you need! If you don’t have hundreds or thousands of hours, or money, to spend on reading books, doing research, and creating the right and supportive environment for you to get better, hire someone who can do that for you. It will cost you some money, but it will be the best investment you’ve ever made. You’ll save on some doctors’ appointment, surgeries, painkillers and medicines that are not reimbursed by your insurance. You’ll also potentially save your romantic relationship and some friendships, as many endometriosis sufferers find out that some of the people around them don’t understand and leave them as a result. Plus, you’ll be on the path to reduce your pain much faster than when you do it on your own. I know, I’ve been there. After spending over 8,000 CHF for my surgery, I still had to pay for my medical treatments, and the doctor’s appointments. If you live in Switzerland, you know that isn’t cheap since you pay for any specific action or question your doctor asks you. So sometimes even a 15-minute appointment can cost you over 150 CHF… In any case, I wished then I had found someone who could guide me. It took me over 6 months to start seeing a difference into how I was feeling, when in just a few weeks my clients see results. Have a look at what Kelly says. And she’s just one example. Another one of my clients got pregnant 3 months within our programme, after over 3 years of trying. Now, that is quite an achievement, but when you put all the right tools and resources on your side, anything can happen! If at any point in time you’d like to discuss how I can help you, you can schedule a complimentary 30-minute optimised health discovery call with me.